Pallets also go much friendly to your exterior important plans! One can organize his patio with them, can modernize his home deck and can add beautiful decors and sitting arrangements to his poolside! 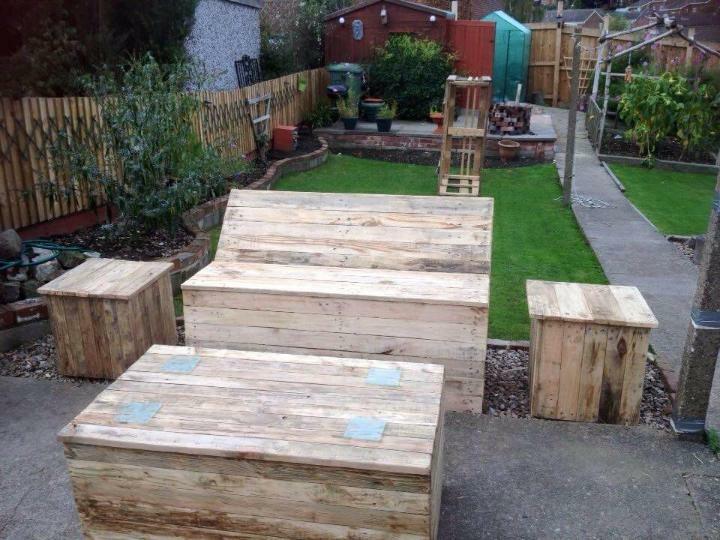 Pallets can also be reclaimed for garden decors and improvements as you can create beautiful wooden garden flooring and walkways and can also set apart your flower beds or vegetable garden using the pallet-made fence! 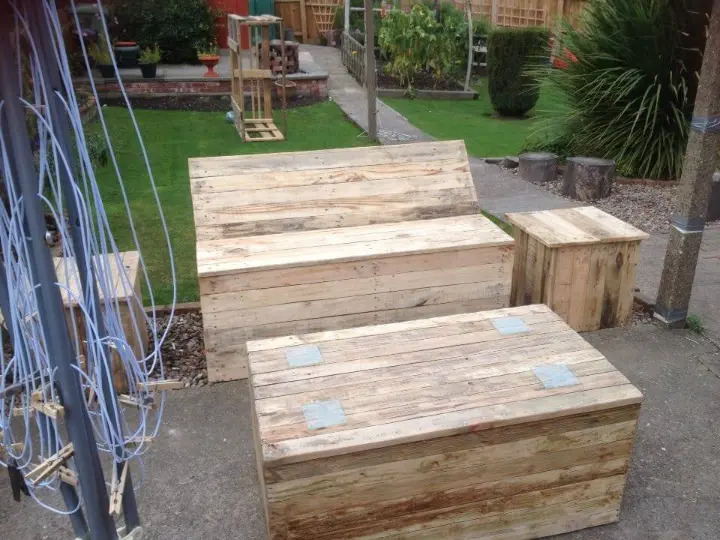 Here we are with this pallet garden and patio furniture set which can also be used on your rooftops, terrace and balconies for pleasure sitting any time! Entire furniture set comes with a brilliantly made beefy bench, two side tables and a pallet coffee table as conversation starter! Entire construction has been done with removed pallet pieces and slats and costs nothing! Dare to build it for your home deck and garden and earn well-organized place at outdoor to entertain your guests! There are many optional changes to make in these handmade furniture pieces! Customize the look of it by using the stain or paint and protect it also from weathering! Take one rule in mind while constructing this whole set of furniture, create the hollow boxes for sofa, coffee table and side tables and then put the lids to them for a complete look! 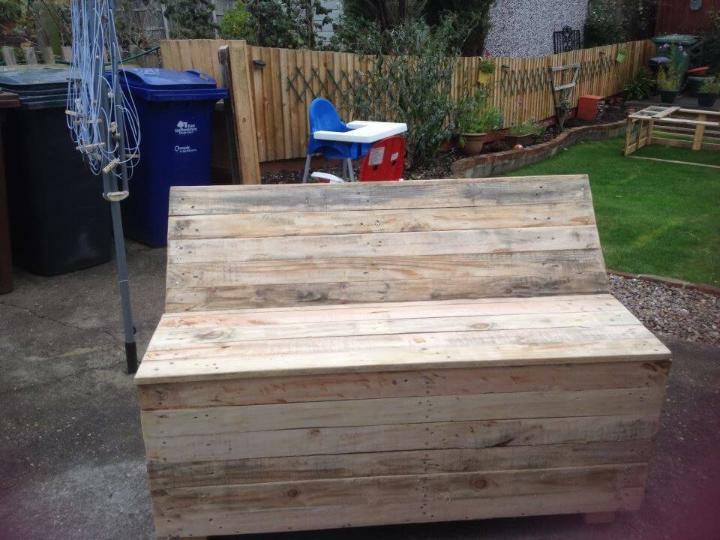 Do add the backrest in case of bench or patio sofa! A big pile of removed pallet slats would be need to duplicate this set at home! Get inspired and go for it now! Bench can individually be used at your garden, at front home porch, at poolside and in backyard! Easy-to-build and perfect to sit back comfortably with your partner! Entire set is sure to come in handy for guest entertainment, individual sitting or to have fun with friends! Custom use of paint can make you get with the desired look! Do sand the edges and surfaces of the designs to enjoy them in brighter wood tone and splinter free wooden nature!